Rod Knecht: Legalization and Regulation of Cannabis – how is Edmonton Police Service preparing for the change. Chief of Police of the Edmonton Police Service. Topic: Legalization and Regulation of Cannabis – how is Edmonton Police Service preparing for the change. Cost: Members free, $30 for Non-Members (Cash or Cheque). Students and seniors: $15. Rod Knecht was sworn in as the 22nd chief of police of the Edmonton Police Service on June 7, 2011 in a special ceremony at City Hall. 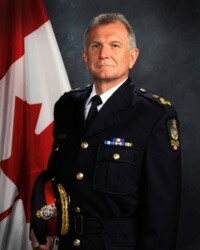 Chief Knecht was previously the Senior Deputy Commissioner of the Royal Canadian Mounted Police (RCMP), ranked as the most senior uniformed police officer in the RCMP. In this role, Rod Knecht was responsible for the efficient and effective operation of all components of the RCMP, including managing a budget of $4.7 Billion and 31,000 employees. Prior to his appointment in Ottawa, Rod Knecht was responsible for the RCMP in Alberta, Saskatchewan, Manitoba, Northwest Territories and Nunavut. In the dual role of Deputy Commissioner – North West Region and Commanding Officer “K” Division in Edmonton, Alberta, he was responsible for managing the operations of 108 Alberta detachments and the delivery of community policing throughout the North West Region. Rod Knecht is a strong advocate for integrated policing. While stationed in Alberta, he was instrumental in supporting the development and inception of the Alberta Law Enforcement Response Team (ALERT) and the Alberta Serious Incident Response Team (ASIRT). Both inter-agency teams are comprised of police services from across Alberta, including the Edmonton Police Service and the RCMP. Over the course of his 40-year policing career, Rod Knecht has spent the vast majority of time working in an operational capacity. He has significant expertise in serious crimes, drug enforcement, undercover investigations, uniform duties, commercial and proceeds of crime and intelligence gathering. He has undertaken key leadership roles in a series of high-profile investigations and events throughout Canada and internationally. One of his proudest achievements was the successful conclusion of the Blood Task Force (Krever Commission); a high-profile, international criminal investigation into the blood system in Canada and the creation of a national victim service liaison program for victims of tainted blood (HIV/Hepatitis C). While Rod Knecht has been relocated on 16 occasions to communities throughout Canada, he considers Edmonton to be his home.